Proper sorting of clothes before washing will ensure everything gets clean, safely. 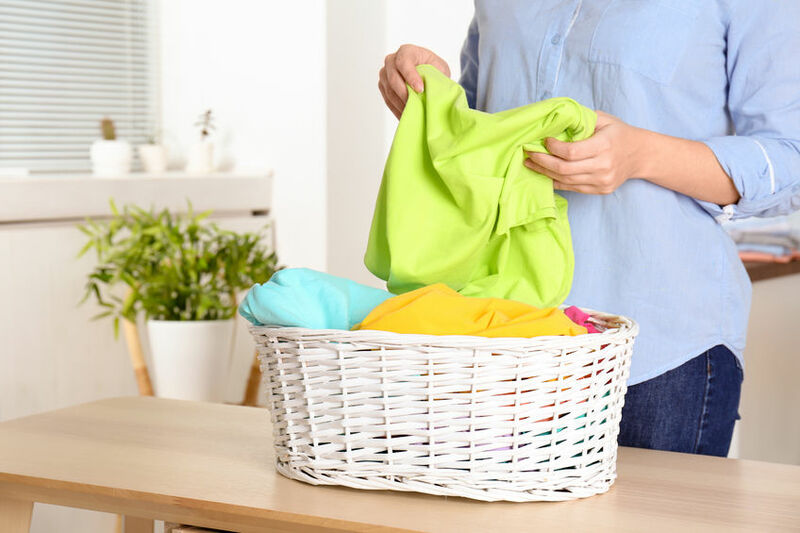 The key to getting all your laundry clean, and keeping fabrics and colors intact in the process, is to sort your dirty clothes by color, amount of soil, wash cycle needed, and water temperature required. Take time to read fabric care labels before you wash. Your clothes will last longer and look better if you care for them as recommended. Here's how to sort clothes so that everything in your load gets clean, safely - in case some labels are no longer legible. Os course, six piles could translate into six loads; if you've got the time during the day or evening, this is the safest way to keep your clothes looking good. However, if time is short and your needs are immediate, combine and wash the cold-water pastels and light colors with the cold-water brights and darks; do the same for your warm-water loads. But do resist the temptation to mix any colors with your white loads. As you sort, be on the lookout for items that have spills or stains (get tips for removing common stains here), really grungy jeans and kids' clothes (very dirty garments actually transfer dirt in the wash to lightly soiled clothes), and those that require a gentle wash cycle. Create three separate stacks for these: hot water, gentle cycle, and pretreat. Once again, you can mix things up in a pinch: If you have only a few light-colored cold- or warm-wash items that require the gentle cycle, throw in similarly colored items that need the same temperature. The add-ins won't get as clean with the gentle cycle's agitation, but it's OK to simplify your wash day. Still, always go with the gentlest cycle and coolest temperature when you mix fabrics and colors. Here's how to sort clothes to keep snags and lint to a minimum: zip zippers, button buttons, brush away lint, and empty pockets before tossing clothes into the washer. Now Separate lint givers, like fuzzy sweatshirts, chenille robes, flannels, and towels, from lint takers, such as knits, corduroys, and permanent-press and synthetic fabrics. Can You Wash Clothes Labeled 'Dry Clean'? But when clothes are labeled dry-clean, must you obey? The dry cleaning industry will tell you yes, and if you can't live without that silk blouse, you should comply. If you clean it yourself, you risk damage like shrinkage, color loss or fading, and fabric texture changes - silk can lose its sheen, and linen can end up looking lumpy instead of crisp. The benefits: If you don't mind gambling, you save money and have the item ready when you need it. Your best hand-washing bets (cold water, please) include plain-weave light-colored silks, cashmere (washed inside out), fuzzy sweaters, and loose-weave knits. While dry cleaning will keep these clothes looking like new longer, some of these may be carefully hand-washed and air-dried.